There are a lot of unsolved mysteries out there in the world. It’s always our hope that someday, with the proper amount of science and research, we’ll be able to solve them. However, it’s more likely that these burning questions will remain unanswered. As far as these mysteries are concerned, all we have are photographs and pictures to puzzle over and wrack our brains about, hoping that an answer will reveal itself. 1. The Woman In The Brown Coat. The woman in the brown coat, or the Babushka Lady as she was later called by the FBI, was very close to JFK when he was assassinated in Dallas. According to eyewitnesses, this woman filmed the entire thing. It’s thought that from her vantage point, she may have been able to answer some critical questions about what really happened that day. However, the FBI was never able to track her down, and no one has since been able to figure out the identity of this mystery observer. 2. The Dyatlov Pass Incident. In 1959, a group of nine experienced Soviet mountaineers died mysteriously in the Ural Mountains. The photo above was taken by the rescue crew. According to the rescuers, the hikers ripped open their tent and ran out barefoot into the snow trying to escape from something. Six of the hikers died of hypothermia, two died of major chest fractures, and one hiker suffered severe head injuries. Alarmingly, he was also missing his tongue. If that wasn’t strange enough, the clothing worn by the hikers was suddenly highly radioactive. On March 13, 1997, a series of bright unidentified lights appeared over the city of Phoenix, Arizona and remained there, completely stationary, for hours. The Air Force said that the lights were flares dropped for a training exercise. However, the lights reappeared over Phoenix in 2007 and 2008. They still have not been explained. Jim Templeton took this photo of his daughter while they were out for the day. At the time of the photo, Templeton didn’t notice anything strange in the marsh area where they were. However, after the film was developed, he noticed what appeared to be a spaceman standing right behind his daughter. There was no one else around when the photo was taken, and Kodak even weighed in, saying that the film was not altered in any way. This photo of four friends for some reason has an extra thumb in it. Just look at the boy in the black on the right. Where could that thumb by his right ear have come from? Supposedly, there is an ancient, dark object that has been orbiting Earth for the last 13,000 years called the “Black Knight Satellite.” No one knows how it got there, its purpose, or even who started calling it the “Black Knight.” The photo above was taken during an American space shuttle mission to the International Space Station in 1998. Photographs of the gaping hole in the South Tower taken on 9/11 show a woman, identified as Edna Cintron, at the edge of the hole waving for help. How Cintron managed to survive the initial impact of the plane into the building has never been explained. On May 20, 1967, Stefan Michalak was in the woods near Falcon Lake, Manitoba, Canada when he saw two cigar shaped UFOs land close by. When a door on one of the crafts opened, Michalak heard voices, and then tried to communicate with the beings inside. He approached the door of the craft, but couldn’t make out anything inside except for what he described to be a “maze of lights.” Suddenly, the aircraft’s door closed, and the object began to rise. It then expelled some sort of hot air at Michalak through a grid-like vent that caused his shirt to erupt in flames. At a local hospital, doctors were puzzled by the grided burn pattern all across Michalak’s chest, which you can see in the photo above. This photo was taken in 1941 at the reopening of the South Forks Bridge in Canada. At first glance it looks like any other picture from the time. But if you look more closely, something isn’t quite right. There is one man dressed in modern clothing among the hats and suit jackets of the 1940s. He also seems to be holding a modern camera. 10. The Madonna With Saint Giovannino. This is one of the most famous unexplained images of all time. 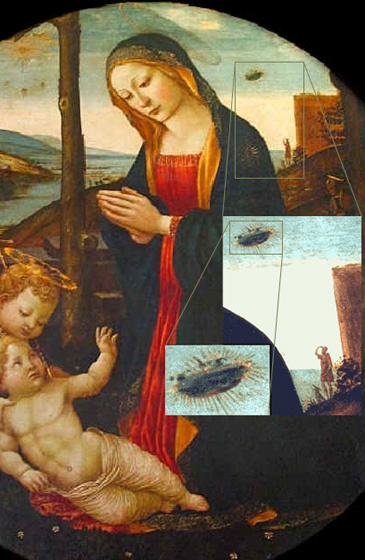 While the focus of the picture is on Mary, something creepy hovers above her left shoulder. There’s an object that appears to be some sort of UFO hovering above the cliffs. Just below it you can see a man and his dog looking up at the saucer. Some of these photos are actually pretty terrifying, especially the one at Falcon Lake. I don’t know about you, but if a UFO landed near me in the forest, I’d be running the other way instead of trying to say hello.